Every person on earth has two genomes. The genome we inherit from mom and dad is the one we are most familiar, and more or less stuck with for life. Our second genome, the one we initially acquire from mom as we pass through the birth canal, is more dynamic and made up of the trillions of bacteria that live on and in our body. This biological fact makes humans supraorganisms – part mammal, part microbe. In fact, the cells of our human-associated microbial communities outnumber our own cells 10 to 1, and at the gene level, it’s a 100 to 1. We are more microbe than mammal. San Bushmen near Tsumkwe, Namibia. Collectively known as our microbiome (our microbiota and their genes), the seeding of this second genome occurs as we pass through the microbial-rich birth canal. From mother to child, this vertical transmission marks a time-honored step in our mammalian-microbe coevolution that dates well before our Mio-Pliocene ancestor Ardipithecus roamed Africa over 4 million years ago. The legacy of this ancient relationship is evident today in the effects our microbes exert on our innate and adaptive immune systems, energy metabolism and the very structure and function of the gut. The fact that humans are colonized by specific members of the microbial community, and nudge other members out, strongly points to the evolutionary conserved nature of the relationship and the likelihood that our microbial partners even selected for aspects of our hominin genome. The biological reality that we are vessels to a vast microbial ecosystem is radically altering our basic understanding of medicine, nutrition, public health and the very scientific foundation of what makes us sick. With an explosion in molecular, DNA-based technologies, the microscopic worth of the microbiome is now being linked to diseases and conditions as diverse as IBD, autism, type 1 diabetes, asthma, cancer, obesity, celiac, heart disease, neurological disorders, metabolic syndrome, and the list goes on. The evolutionary and ecological forces that are thought to have shaped our microbiome are governed not only by host genetics, but are profoundly conditioned by diet and lifestyle. In just a few thousand centuries, our kind has gone from nesting in trees, to making stone tools and digging roots, to kindling fires, to subduing flora and fauna, to erecting massive cities, and finally to downloading Angry Birds over 1 billion times (and counting). For most of this march to mammalian dominance, our supraorganism adapted to a nutritional and cultural landscape that literally changed at a glacial pace. But more recently, rapid adoption of technology and need to feed a growing population a shelf-stable food supply, along with hyper-sanitized food and water, increasing rates of c-section births, formula in lieu of breast milk and antibiotics for every sniffle, we are now out of sync with the microbial world. Therefore, it may be more correct to say diseases of modern life represent discordance with the ancient microbial world from which we all came and our guts are still stuck in. By yoking microbial biodiversity of the microbiome to diet, lifestyle, and changing cultural norms to the diseases of the modern world, a new paradigm in medicine that places humans in an ecological perspective is emerging. The current reductionists approach in medicine that has emphasized studying disease in isolation, only involving human physiology and human genome, will have to come to grips with the realization that a vast and complex ecological community of hundreds of bacterial species and their genes may be responsible for the aberration of interest. Causality it seems may be getting a lot more knowable. From this ecological perspective, the potential loss of microbial diversity with one-quarter of the earth’s mammalian species facing extinction, and the reduction in biodiversity in floral communities that are running parallel, highlights the impact of globalization not only on terrestrial and aquatic ecosystems, but its staggering impact on our inner ecosystem. Rapid changes in diet and cultural practices in the very recent past are homogenizing our gut microbiome and tinkering with, or worse, erasing, some very important evolutionary histories with our microbes. If our microbial communities are a sum total of the nutritional and environmental landscape we evolved upon, and cultural practices and even family history matter as well, then our human microbial ecology should serve as the backdrop against all diet and lifestyle considerations in our modern world. This also requires that we think about Paleo Diet not for the last 2 million years, but from the more ancient perspective of the microbiome and its relationship to our evolved adaptive and innate immunity, intestinal environment (e.g., bio-chemical characteristics of mucosal surfaces), and gut morphology. A deeper view is needed. The subjective start of the Stone Age (which if the data holds could stretch back 3.4 million years now), or the arbitrary endpoint of agriculture, may be of much less consequence on our dietary needs from the perspective of the microbiome. As the avalanche in research connecting the gut microbiome to a never-ending list of ailments grows more persuasive by the day, what is it that our microbiome and our ancient gut are trying to tell us? For autoimmune diseases, our gut is likely seeing ghosts among the trillions of microbes in our nutrient-rich intestinal tract, jumping, twitching, and over-reacting to friend and foe that seem to duck in and out of the oozing milieu. Our lives and food supply have likely become too clean, and we may be missing some “Old Friends” who once trained our immune system. For the low-grade inflammation associated with type 2 diabetes, heart disease, and obesity, our easily digested modern diet and decrease in diversity of foods (mainly plants) is literally starving our microbiome, reducing species diversity and richness (dysbiosis), and providing ecological niches for opportunistic organisms to take hold. This opening of the pathogens door coincides with an opening of the once tightly regulated pathways to our inner systems. Our guts now leak and we are likely witnessing the effects system wide, all the way to the brain. Research comparing the gut microbiome of humans and other animals using 16S ribosomal RNA gene sequences provide some interesting insight into the diet our microbiome might be most accustomed, tuned our immune system, and kept our gut from leaking. When the gut microbiome of herbivores (e.g., sheep, cow, giraffe, gorilla, horse, rhinoceros), omnivores (e.g., ring-tailed lemurs, baboon, humans, chimpanzee, bonobo, spider monkey), and carnivores (e.g., polar bear, dog, hyena, lion) are compared, human samples not surprisingly cluster more closely with other omnivores. Interestingly, when compared to other hominids, humans cluster more closely with the bonobo diet. While bonobos do eat a small amount of leaves and meat, they are true frugivores, with a diet dominated by, as the name implies, fruit. Therefore, from the perspective of the microbiome, humans may be considered frugivores, although specialized, eating seeds and meat depending on availability. Flexibility is fundamental. Deeper shotgun prosequencing of the genes encoded by the trillions of bacteria in the gut across these same diverse mammals, reveal that the microbiome of carnivores are endowed with enzymes specialized to degrade proteins as an energy source, while the microbiomes of herbivores like sheep and gorillas are enriched with enzymes specialized to synthesize amino acid building blocks. Humans, in this case, are more like the gentle herbivores than the top-level carnivores we are often compared. The microbial component of human evolution is important to understanding health and disease as we undergo rapid changes in socioeconomic status and the amassing of populations in urban settings with less and less connection to our shared, and symbiotic relationship with nature. The fact that we can’t, despite billions spent on genome research, predict with any reasonable certainty what disease you might get from our human genome, but can with 90% accuracy tell if someone is obese or lean from the composition of their gut microbiome, should be a humbling departure from our anthropocentric worldview. As we look back for guidance on how we should go forward, giving more thought to the complex and symbiotic interaction between us, and them, will provide a framework that will more accurately represent the human ecology of our past. 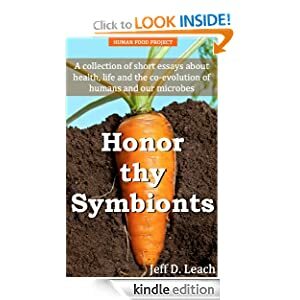 By seeing ourselves more connected to the microbial world, and as members of simple-gut fermenters, the technological novelties that punctuate our past become smoothed-over with an immunological memory and a gut barrier forged over deep time, evolutionary time. * A version of this article appeared in Paleo Magazine. Pingback: culinary karma | should we crave sugar? are you addicted to it?